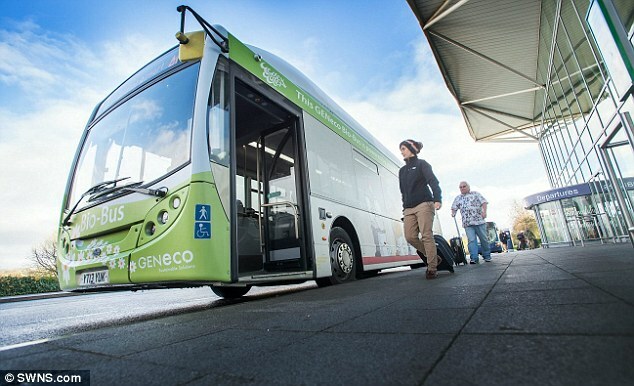 The 40-seater ‘Bio-Bus’ is fuelled by biomethane gas, generated by the treatment of sewage and food waste at a processing plant in the south west and a single tank of the gas – produced using the typical annual waste of just five people – is enough to power the vehicle for 190 miles (305km). The gas is being produced at a Wessex Water sewerage plant, run by energy firm GENeco. The annual waste of a bus-load of people would provide enough power for a return journey from Land’s End to John O’Groats, while producing fewer emissions than a diesel engine. Today’s maiden voyage saw the first passengers travel on the route from Bristol Airport to Bath, Somerset – a distance of around 20 miles (32km). The gas is generated through the treatment of sewage and food waste that is unfit for human consumption. Engineers believe Bio-Bus could provide a sustainable way of fuelling public transport while improving urban air quality. The gas produces fewer emissions than traditional diesel engines and is both renewable and sustainable. 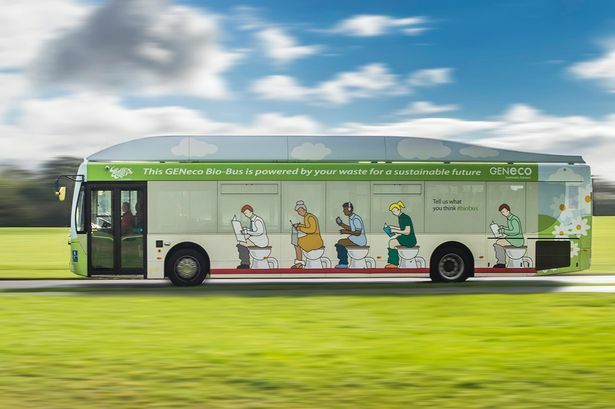 The Bio-Bus can travel up to 186 miles on a full tank of gas, which takes the annual waste of around five people to produce.